Effective planning and control of manufacturing operations allows businesses to achieve maximum profitability by reducing uncertainty at all stages of the manufacturing process. 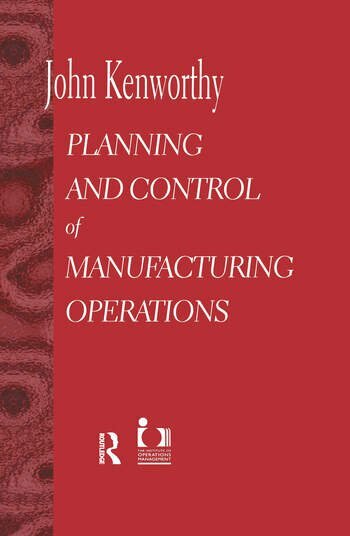 In this book, John Kenworthy offers an easy to follow overview of the principles and practice of manufacturing control, with the emphasis throughout on practical approaches and techniques rather than on theoretical discussion. The author demonstrates that many problems are common to different types of manufacturing enterprises and offers practical solutions which can lead to a dramatic increase in overall performance. Sales forecasting, distribution planning, capacity planning, scheduling, and continuous improvement policies are among the subject areas covered. Exercises at the end of each chapter help readers assimilate important points. This book will be an invaluable aid not only for industrial managers who are responsible for manufacturing planning and control, but also students, trainers and anyone wishing to increase their understanding of manufacturing control systems. The manufacturing control problem; Achieving control of the business; Master production scheduling; Manufacturing orders; Order policies; Lead times and safety stocks; Bills of material; Sales forecasting and distribution requirements planning; Capacity planning and short term scheduling; Optimised production technology; Just in time and continuous improvement; Implementing manufacturing control systems; Answers to exercises; Index.